If you haven’t met Shades, our Director of Customer Relations, at one of the many trade shows he’s attended, you’ve missed a treat. This wacky quack is the life of the party. But he’s duck-down-right serious about making sure SPC Display Group clients are treated well and get the best value for their dollar. You could say Shades is the heart and soul of SPC Display Group. Of course he does have bird-brains, which, in this case, simply ensures he helps make us – and our clients – laugh, even as he reminds us that value has to be our first priority. Known for some time as a pretty good egg, Shades developed an entirely new approach to helping SPC feather its nest. Wearing his hallmark sunglasses, Shades has become an integral part of the company’s advertising. He also has a cyberspace presence, which he refers to as his web foot. Though the purpose of his other foot has not yet been fully determined, he says it does prevent him from wasting valuable time swimming in circles. It is in the competitive pond, however, that Shades demonstrates his real talent. He proved a tremendous asset to his employer when he first made an appearance at GlobalShop 2001, drawing potential customers to the SPC exhibit like...well...ducks to water. Adoring fans kept Shades busy throughout the show’s tenure, handing out stuffed hatchlings that bore a surprising resemblance to himself, although lacking the signature dark glasses. 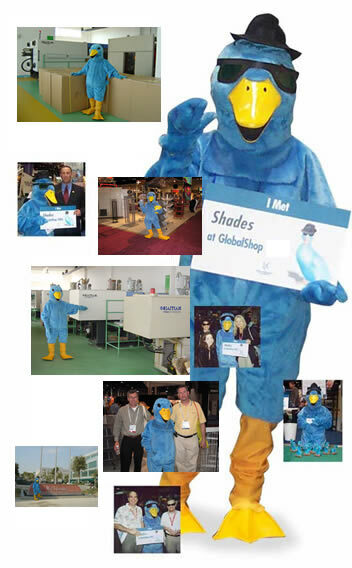 Over the years Shades has become more widely known by his nom de plumage. Having come to SPC Display Group as an orphan, at GlobalShop 2002 Shades was given his name in a competition that resulted in hundreds of suggestions. Shades accepted his new name happily, grateful that so many people had taken him under their wing. Expected to be a regular feature of the SPC exhibit at GlobalShop and other shows and events, including StorePoint, as well as an increasingly important advertising icon, Shades will be kept busy. Nevertheless, he says, he will be available to help customers determine the best value for their store fixture dollars, even if it means shaking up preconceived notions, especially in the area of overseas manufacturing partners and imported products. "You have to migrate," he says. "Otherwise, you’re just a sitting duck." We certainly hope you have an opportunity to meet Shades soon.